We are looking for a responsible, committed and skilled person to join our staff team in the New Year. We will require a part-time Caretaker / Centre Assistant from February 2018 onwards to support in the smooth running of the community centre. The main responsibility of the role will be to maintain a secure on-site presence, mainly working Monday to Friday between the evening hours of 5.00pm – 9.30pm, with occasional Saturdays as and when required. The suitable candidate will possess good DIY skills, have knowledge of Health and Safety guidelines, good customer service skills as basic cafe duties will be required, and a willingness to learn new things. The successful candidate must hold a full valid driving licence and have use of their own vehicle. Travel expenses will be paid. Click here to download and read our full Equality & Diversity Policy. An application pack may be collected from the Centre office between 9am-3pm Monday to Friday. 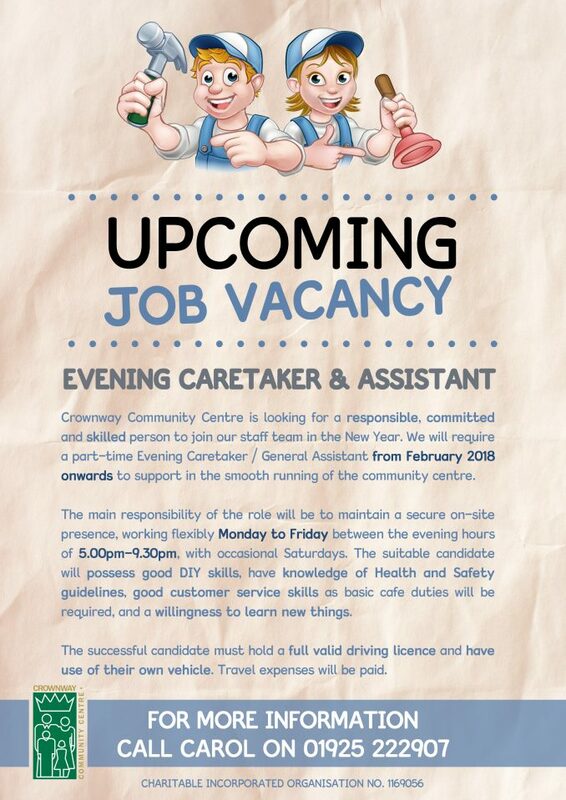 Alternatively, contact Carol or Craig on 01925 222907 or email: craig@crownwaycommunitycentre.co.uk with your full contact details. Please do not include or send your CV. This is an application process only. This post will be subject to an Enhanced DBS check paid for by the organisation.